Some utterly last minute cuties insisted on being born this month. I tell ya, this stuff is all out of my control. I put everything on hold and started sculpting day and night. I'll pop them in my etsy shop tonight. 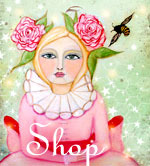 Look in the left hand sidebar of my shop under Art Dolls & Elves to see them. Etsy is having a little glitch and they are not showing directly in my shop at the top. If only you could see them sparkling in person. Sweet little things make me so happy. These sweeties are in the shop now looking for homes. They probably will not arrive before the 25th but maybe the day after to help with the after Christmas blues? I hope I get to see you before Christmas, where has the time gone???! ps: Remember to look in the left hand sidebar of my shop categories, they'll be under Art Dolls & Elves. Oh, the wonderful days of soil and sun are here. I've been ever so busy my friends. I need a really long nap, and I think I'll take one soon. Although I have a hard time napping, you? I have one too many pics to share to today. But, if you grab something good to sip, it might not be too long and crazy. There's endless garden magic happening. Is there really any other word better than magic that can properly explain spring? The fresh leaves, the golden sun, the good-bye to winter. The memory of what the garden looks like when it is full and lush. Grape leaves ready for dolmades. Can we just talk about them for a second? I never really longed for them, I never even planted them. I never was ever inspired to smell them. I never really gave them a second thought. And then I planted a bunch this winter. I had no idea they could be perennials, could withstand winter and would grow so huge and fill my garden with so much joy. I mean, I see them in Disneyland and outside hotels. I just never thought about them for myself. I was wandering around the other day asking myself what that beautiful scent was. As I said, I have never felt compelled to smell a snap dragon. I'm not sure why I never considered them as I find them awfully beautiful. Anywho, I was wondering what the scent in the garden was. I could smell orange blossoms, jasmine and roses but what was the other element? Then I sniffed the snapdragons. I went from color to color in awe. The scent was filled with memories. Almost like my mom's faint perfume. Or the faint scent of confections. So mild and so beautiful. And here I was giving all the credit to these beauties. I tell you, the garden teaches me something new all the time. The lady banks roses are in full bloom. Going crazy over arbors and little buildings in my garden. I just love poking around. Seeing all that goes on. Buildings being utterly devoured by roses. I wished for this years ago and almost have to rub my eyes everyday in disbelief. I just hope they don't cave in my buildings and arbors, haha! They're even hopping onto my office stoop. I just roam around in dream goggles. So utterly thankful to mother nature. How can it be that such wonderful things can exist? Bright sun filled garden today. I tried to get Matty to pose for a photo, you know how much he hates them. And of course, in runs the ham. They were bickering with a hawk that kept taunting them. Squawking at them like mad. Watching them fly around and swoop down. I had to run out of town to my parents the other day and they would do the same to me at their house. She said the hawks never come that close to her. Maybe they thought I was a chipmunk or something? My blog post would have ended there for today, but then I took more pics after watching the hawk. It's was so sunny and watching the flowers multiply and fill-in is my fave past time. I realize I may be a broken record. You may ask yourself, is this just a gardening blog? Does she ever post about anything but her garden? What happened to arting and crafting? Could she be any more boring? And then it finally takes off like wild fire. You get kind of obsessive about it. The last two years the gophers kept disrupting the roots of this rose bush. Poor Phyllis Diller rose bush. And this year she's doing awesome. Just like she was when I first brought her home. So, you can understand how I might obsess a little. And want to obnoxiously show you everything. Thanks for humoring me and my garden ways. Garden magic and garden spells. Garden dreams and garden enchantment. And when all the rose bushes I transplanted, that were thought dead due to gophers, start to sprout tiny signs of life in their new pots, I almost faint from joy. It's my fairy tale place. Who's been painting the roses red again?! And so, I give you another garden visit. My happiest place on earth. Where all my woes fall away and I play in soil. Pruning and loving every moment. The doggies are doing great. So is that hatter and all the other characters in my life. Mom gave us a real scare with bad food poisoning so I raced down there. So good to be with her, and we had a lovely time after she got better. I even jumped in a frigid pool to amuse her. I've really been going non stop the last few weeks. City, country, this and that. It's time for me to rein it back in and take some me time I think. How are you out there in the great big world? What goes on in your neck of the woods these days? Thank you to those who chime in and say hello. I love reading your goings on. So wonderful to know you are there. Merci beaucoup for that, infinity. Lots of love from me to you! See you sooner than the last time. It's so early but it's happening. Nature sprinkling its magic upon us where the desert meets the forest. Is it happening there too, where you are? The hatter gave me a fairy piano, sweetest little thing. And I'm collecting first roses. I don't know why spring always amazes me so, but it does. I run outside every morning to see what new leaves are springing forth. I'm having so much fun in my studio and trying to enjoy open windows and doors as much as I can before the real heat finds us. Although we are having a heat wave now, which is a bit nutty so soon. The fruit trees are just sublime as they bloom. Peach tree pink makes me so happy. As wisteria blooms start to form. It's all happening right outside the window. I noticed yesterday that the roses that are gobbling up entire buildings in my garden are also intertwining with the wisteria. This makes my fairy tale loving heart crazy overjoyed. The cool evenings, the delicious light. The bees are in love with the plum trees right now. My babies follow me around as I do the morning and evening rounds. They look around at butterflies and birds, just watching nature flutter about. Our little guardian keeps watch intensely. Making sure that no one enters his dominion. Sometimes he won't even leave his post and join Miles and I roaming the garden. He just sits on the top front porch stairs, looking. But Miles and I are too bewitched by pink fruit blossoms and winding wisteria to worry. We leave that up to our Matty protector. Oh and did I mention the tiny clusters of roses? I love love love these beautiful days. But I said that already didn't it? As the day winds down I follow the garden path. Their always familiar sugar and milk scent activates my memory bank. And as everything glows I cozy back up in my studio. Enjoying it all, just like the bunnies and critters in my new favorite chocolate tin are. I've been going to and fro, doing so many things lately. I've been having fun decorating in the city a bit and working on some art here in the country. I'm thinking about giving the country pad a facelift too. I always want to keep this homebase no matter what, and enjoy it, so it's important to give it some love. The garden is calling my name again, tending garden is taking center stage. Our winters are so short, but I did get a nice little break from heat and early morning. Time to plunge in again. The quail are having babies and the bees are buzzing like mad. Nature knows what to do and when, amazing. I so hope you are having lovely days out there. I can't wait to see what tomorrow brings in the garden. The gophers did a number on some rose bushes so I'm hoping and praying they make it. I moved them to pots and baby them like mad. I check them several times a day to see if there is any sign of life. I do see little red nubs forming, I may faint from joy if all works out. I've invested in ever so many giant pots and some of the other rose bushes I saved are doing incredibly. We are so lucky to have these things called seasons. Fill me in on your first days of March, oh and, welcome March! I've so been enjoying the last few days of full Halloween immersion. Some parts of my house are still pastel infused. But spooky bits and bobs are trickling in. I love haunted house tales, so this area is an ode to the haunted playroom. We've been watching lots of scary movies and eating too many treats. She looks quit harmless there, smiling with her dolly. But if you're in the room, in any angle but straight on, she looks like this. And that changes everything, doesn't it? Is she nice or wicked? I usually worry that I am not getting enough Halloween. If you are a Halloween lover you know what I mean. But this year I really have truly enjoyed it so much. Taking some time to just enjoy and savor the season. Just beware of who's watching you. We'll be right here, playing in our haunted cove. Waiting for the clock to strike midnight. The dining room has gotten some black and spooky infusions. Not enough tricks though, but I'll leave that up to Matty and Miles. It's time for pumpkin pancakes and some dark honey my friend brought me. I love today and tomorrow, love love love! I intend to have more fun than I can handle. I'll try to come back sooner than soon with more pics. Have you ever tried to play the Ouija?